Slight update, new theme, a customised OSX-Arc-Darker for GTK and Cinnamon, rest are as listed in the terminal. 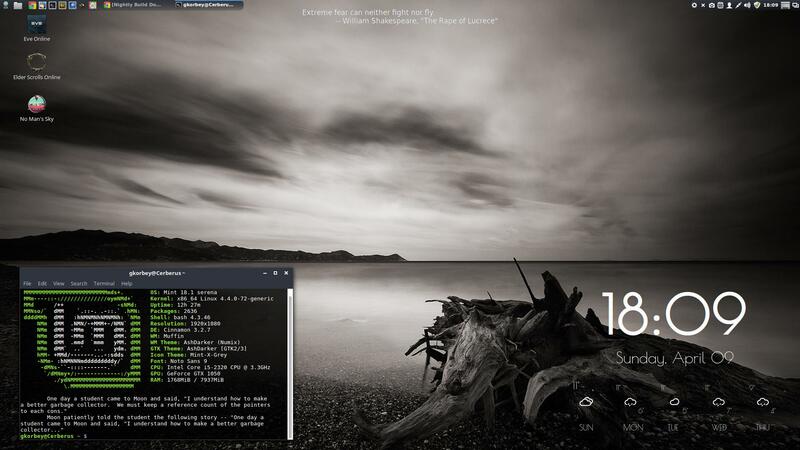 Switched out the clock and weather desklets for Conky and changed the background. Topic: Gimp 2.8 / Babl / Gegl - Easy install script. Re: Gimp 2.8 / Babl / Gegl - Easy install script. 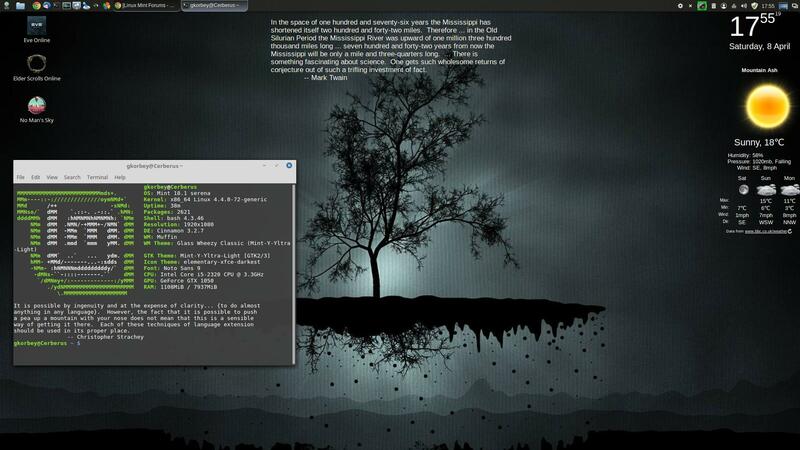 I expect update pack 5 will be coming sooner rather than later now, as Linux Mint 13 XFCE and KDE are almost done. Got a new Geforce GTX550ti, the above is no issue with the Nvidia cards, so for me, problem solved. However, the 12.6 AMD driver does fix the above issue if you have a compatible card...alas the 4850 only gets the 12.6 legacy driver..which STILL has the issue, in it's current beta state anyway. I should add, I have the same issue if I use the driver in the repositories too. Topic: My PC Hangs for no reason! Re: My PC Hangs for no reason! Are you using LightDM as the login manager or the default MDM? I ask because I was having similar issues, and I'd switched to using LightDM as soon as I installed mint. On a whim I switched back to MDM the other day and have been crash free since. Had a fun morning today getting a version of unity greeter working with it. It's the only bit of Unity I like and a nice look for a login screen.